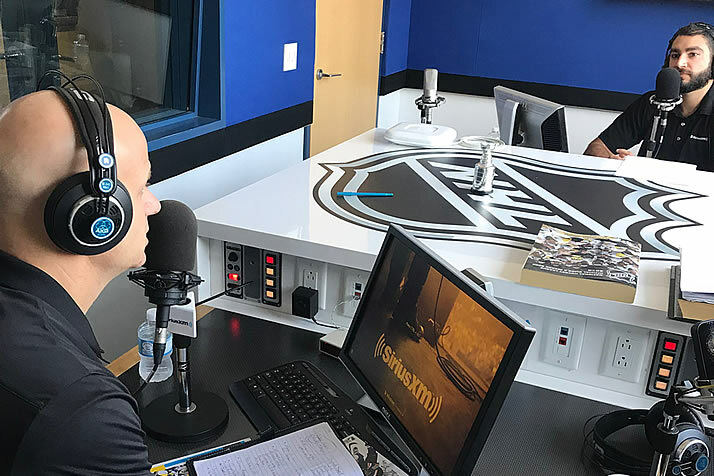 Snee Joins NHL Network Radio - College Hockey, Inc.
College Hockey Inc. Executive Director talks hockey in SiriusXM studio visit. Mike Snee is entering his seventh season leading College Hockey Inc.
A visit to Toronto for a Wednesday night event gave College Hockey Inc. Executive Director Mike Snee an opportunity to visit the studios of NHL Network Radio for an appearance on “Hockey Today” with co-hosts Nick Alberga and Jake Hahn. The top teams and players heading into the 2018-19 NCAA season. The segments covered nearly 30 minutes and are available in full below. NHL Network Radio is channel 91 on SiriusXM and available online via SiriusXM’s streaming service.